Several months ago I woke up in the middle of a nightmare with a traumatic flashback fresh in my mind. My heart was racing, my chest was tight and my body was drenched in sweat. I tried to shove the memories playing in my head to the side, but I couldn’t shake the feeling of sheer panic. In my delirium I struggled to catch a breath and got up to splash some water on my face. The cold water refreshed me as it washed away my beads of sweat, but seconds later I felt tears taking their place. Usually I would have stopped the water works from getting too out of control. You know, stuff the tears back where they came from. But this time, as the rolled down my cheek, I didn’t try to stop them. Like a rushing river I just let them flow. I looked at myself in the mirror and scowled. What’s wrong with you? Seriously … you’re pathetic. You should be ashamed of yourself right now. I knew these thoughts were lies from the enemy, but the longer I stared at myself the more I started to consider them. Sure, there is always hope in Jesus, but part of me felt hopeless, like a Humpty-Dumpty who could never be put back together again. Darkness has a way of making us question who we really are. If you’ve seen any of the Star Wars movies, you’re probably familiar with the Force. There’s the Living Force (i.e. Yoda and Obi-Wan Kenobi) but there is also a Dark Side (i.e. the Sith and Darth Vader). Here’s the thing: Vader didn’t always belong to the Dark Side. Like so many of us he began his journey as an innocent, wide-eyed child of the day. But somewhere along the way the darkness found him, and it made him question who he was. Suddenly he was lost and confused — fighting a battle against light and dark while forgetting his true character. Friends, we too face a similar battle each and every day. There is an enemy. There is darkness. And it will do everything it can to blindside us and steal our joy and identity in Christ. On the night of my flashback several months ago, I was blindsided by my past — by something I thought I’d dealt with but was resurfacing once again. The darkness found me and the enemy was trying to beat me down. 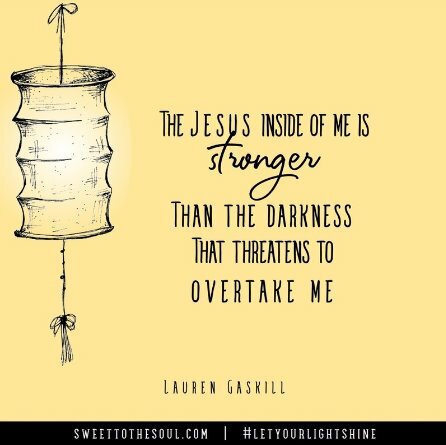 Deep in my soul I know the Jesus inside me is stronger than the darkness that threatens to overtake me. I also know who I am. I am a child of God. A child of the light and of the day. A child with 24/7 access to joy, love, peace, hope and the power of the Holy Spirit. A child whose Heavenly Father loves her no matter what. A child who can face the darkness because the light inside her can help her overcome anything. You see, there is a darkness but we don’t belong to it. And not only do we not belong to it, but it also has no authority over us. Friends, I don’t know what darkness you may be struggling with in this season. But whatever you’re facing, I want you to know the darkness does not control or define you. There was a time in my life where I let my struggles define me, but I’m not going back there — to the darkness, to the night, to the overwhelming pit of despair. And neither are you. 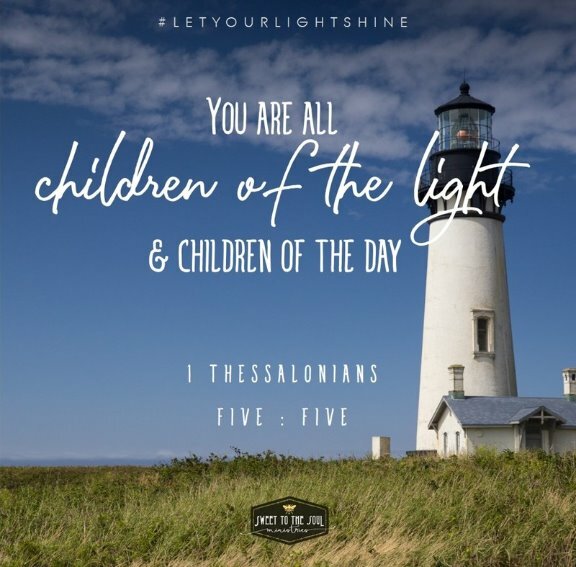 Because we have been called into the light — into abundant life. And we don’t have to even entertain the darkness because as children of God it’s not who we are. It does not define us. God is the only one who defines us. So let’s run into the light. Run into the truth. Run to God’s word. And run into His arms — where we truly belong. Lord you know we long to walk in the light and to leave the darkness behind. Help us not be overcome by the night if and when it comes. Help us remember that our struggles do not define us. Help us receive our identity from you and you alone. Remind us of the promises and truths you have spoken over us, and fill us with your peace and hope right here, right now. In Jesus’ Name, Amen. 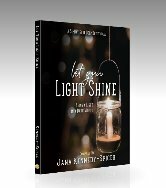 ​Lauren Gaskill is an author, blogger and speaker who is passionate about inspiring others to lead joyful, healthy, redeemed lives. She believes life should be sweet — rich in stories, and full of good food, love, encouragement and inspiration. 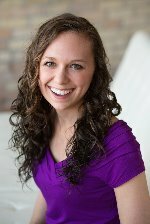 Lauren is the creator of MakingLifeSweet.com and the Finding Joy podcast, and she is in the process of publishing her first inspirational book. When she’s not writing, Lauren is creating new recipes in the kitchen or spending time outdoors with her husband and Cavalier King Charles Spaniel.